This year, Highlander Institute is staying connected with our Cohort 1 Fuse Fellows through a Fuse RI Alumni Tour. Every few weeks, we visit 3-4 Fuse Alumni around the state to catch up with them in their current roles. Follow the hashtag #FuseRIAlumniTour for more updates! 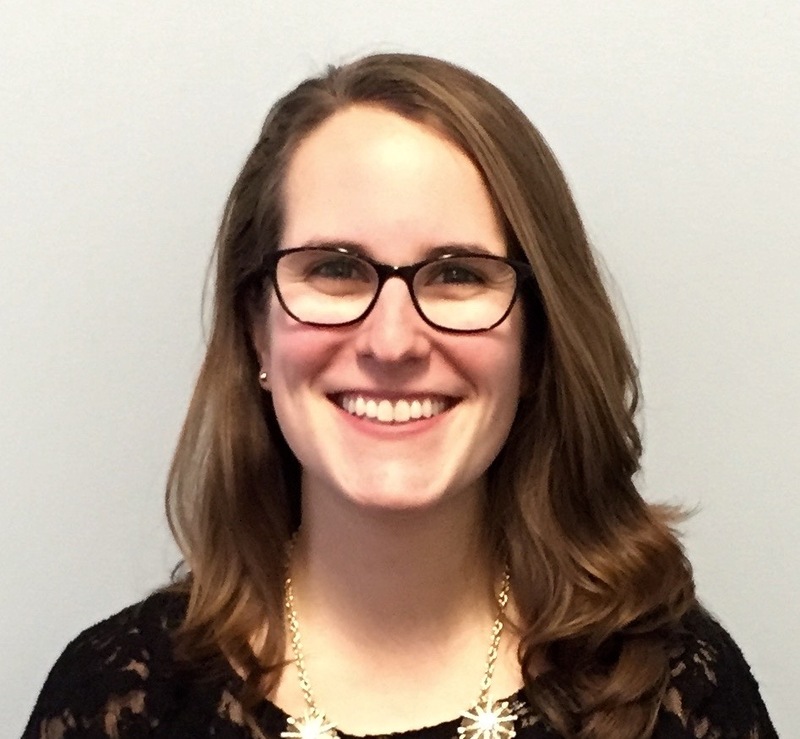 Tracey Nangle is a middle school social studies and ELA teacher at North Smithfield Middle School. During this visit, we saw her in action with an 8th grade geography class. One task involved researching a national symbol to discuss how it represented the spirit of the Canadian people. Students chose their own symbols and also selected how to demonstrate their knowledge with different final products. These products included Google Slide Decks, Blendspace playlists, Glogster posts, and handmade illustrations. Another activity within the self-paced unit had students leveraging Google Maps to create their own virtual tours of Canada. Students highlighted specific cities and tourist experiences, adding images and explanatory text. During our visit, 2 students figured out how to work collaboratively on the same map, and Tracey named those students new go-to techsperts. Each student in Tracey’s class has a magnet with his/her name on it, and students move their magnets to match their pacing on the front whiteboard. Over the course of our 30-minute classroom visit, multiple students popped up from their seats at the conclusion of a task to move their magnet to the appropriate activity. This self-management and awareness saves Tracey a lot of time, and instead of focusing on logistics, she is freed up to conference 1-on-1 or with small groups of students. 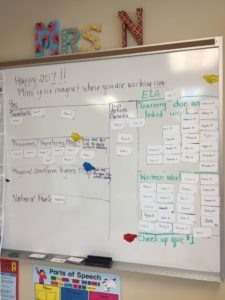 Students mentioned “if your magnet’s on the same task for more than one class period, she knows there’s a problem and comes over to see what’s going on.” In addition, there are several check-in opportunities built into the unit as evidenced by “see me for quiz link when you’re ready!” notes. At the end of the class, Tracey encouraged students to set a reflective goal for Monday of where they’d like to be. This year, Tracey and her classes are participating in a Global Postcard Exchange. 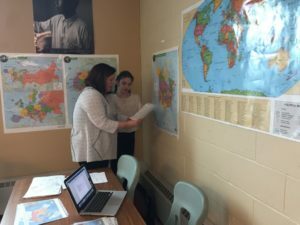 Her students designed their own postcards during an introductory geography unit, and shared their school experiences with their peers from around the world. Examples of the postcards they’ve received in return are hung around the classroom. 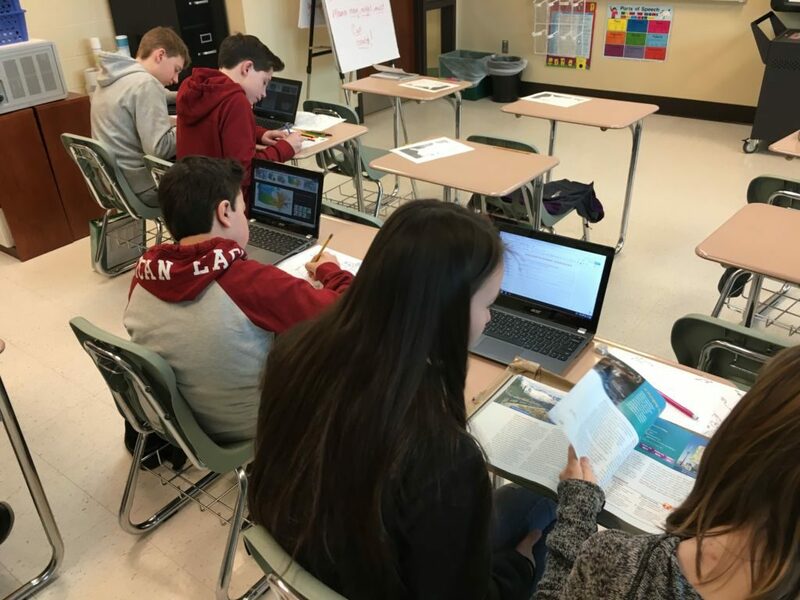 Many student responses talk about learning with technology, and Tracey encourages her classes to think about the shifts in the traditional education system that are currently underway. Tracey is making a big push this year to front-load instruction on digital literacy skills, especially with her younger students. 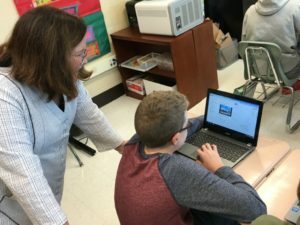 Many of her classes struggle with using Google tools, managing their work files, and internet research, and by focusing on these skills early on, she’s building capacity in her learners. 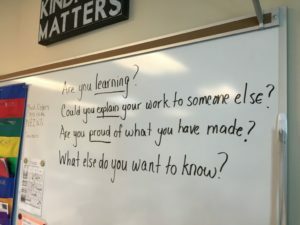 Several of the apps and websites she taught students about at the beginning of the year are coming into play now as students use them to creatively share their learning.